The weapon of a Rock God(dess). Created by the gods of music: Electra, Epitaph, and Geffen. This "lute-like" instrument is may be properly played by any character of 3rd level or higher. 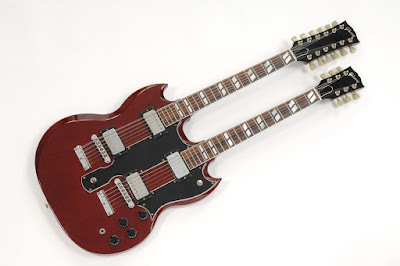 It has two necks used to play music, but share the same body. A character using this instrument gains the following abilities. The One That Giveth - This ability grants the Fast Healing ability to one or more character with a successful Performance check, to make a check the character must roll under their Charisma using 1D20. At 1st level the ability grants a target Fast Healing 2 (Heal 2 HP a round). The Fast Healing increases by +1 every 4 levels after the 1st (5th, 9th, 13th, etc...). The character may also target another person for every 4 levels after the 1st (2 at level 5, 3 at level 9, etc...). This effect lasts for 1D6 + Character Level rounds after the bard has stopped playing. The effect ends if another instrument ability is used, even if there is still rounds remaining on a previous effect. The One That Taketh - This ability may target 1 character/monster at 1st level, and an additional target for every 4 levels after the first (5th, 9th, 13th, etc...). The damage inflicted by this ability is 1D6 at 1st level, and increases by 1D6 for every 4 levels afterward (2D6 at 5th level, 3D6 at 9th level, etc...). To inflict damage the character rolls 1D20 with a target number based on the bard's Charisma and the target's Wisdom. The target number starts at 10 and increases by 1 for every point of Wis the target has more than the character's Charisma, the target number is reduced by 1 for every point of Charisma the character has more than the the target's Wis. In the case of Monsters, their comparative number to the bard's Charisma is equal to the monster's HD+5. (e.g. A character with an 18 Charisma targets a Wizard with a 16 Wisdom, the target number is 8 [Difference of 2 in favor of the wizard, minus 10, equals 8]. The character then targets a 14 HD monster, the target number is 11 [Monster HD 14 + 5 bonus = 19. Difference of 1 in favor of the monster, plus 10, equals 11]). Anyone hearing the character can be effected. Each time the ability is used, the character must make a new roll. A single roll is made for multiple targets. The damage ignores damage reduction from armor. The Tandallum / The Uncertain Dance of Electrons.